The latest Disney stage adaptation has landed at Crown Theatre, bringing with it all of the wondrous treasures from the 1992 on-screen original, and a few extra trinkets to boot. Based in Middle Eastern folk lore, Aladdin takes us back to the fictional city of Agrabah for another telling of the classic tale of the ‘street rat’, the princess and the mystical magic lamp. On stage, the narrative sticks to much of what we remember from the film, opening with Genie giving a powerhouse rendition of Arabian Nights, setting the bar for what the audience could expect from the rest of the finely-spun tale. Dancers emerge in dazzlingly vibrant costumes, performing chaotic choreography as they spruik their wares. 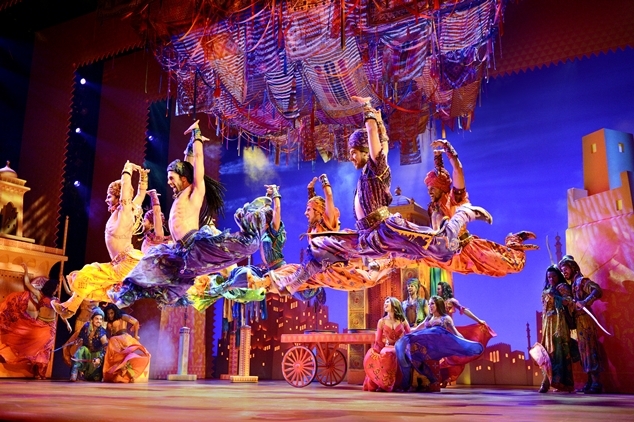 The chorus forms the set in a convincing illusion of a bustling bazaar – where we are introduced to Aladdin and his merry men. Disney super fans will be pleased to learn that the stage version keeps a tasty chuck of dialogue from the movie (PHENOMENAL COSMIC POWER, itty-bitty living space…), while throwing in new gags, songs and even characters to keep the well-known story fresh for all audiences. Al’s on-screen simian sidekick Abu is replaced by three human characters, which we learn through one of the catchier new tunes are named Babkak, Omar and Kassim. Much like Abu, the trio often serve as comic relief, and as loyal allies to Al as he attempts to win the heart of Princess Jasmine. Each of the named characters in the ensemble cast were outstanding in their role, bringing that recognisable Disney flair to the stage. Ainsley Melham’s adorable roguish charm and crystal-clear vocals made for the perfect protagonist, Shubshri Kandiah embodied the animated Jasmine in look, attitude and singing talent, and Adam Murphy & Aljin Abella were wickedly camp, melodramatic and evil as Jafar and Iago. 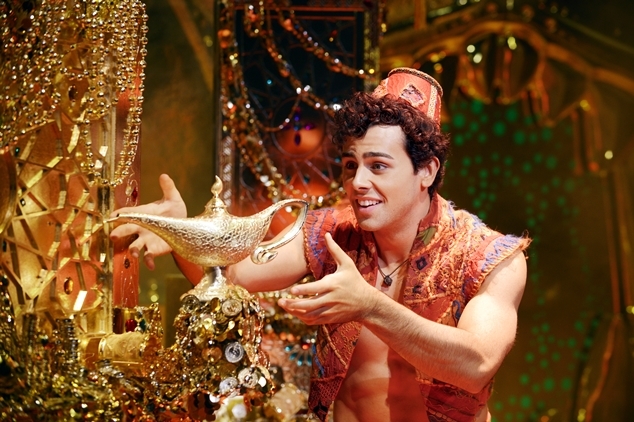 But just as Aladdin finds treasures beyond his wildest dreams in the Cave of Wonders, so too was the opening night audience treated to a rare theatrical phenomenon – a standing ovation in the middle of a show. Gareth Jacobs’ Genie is an absolute wish come true. 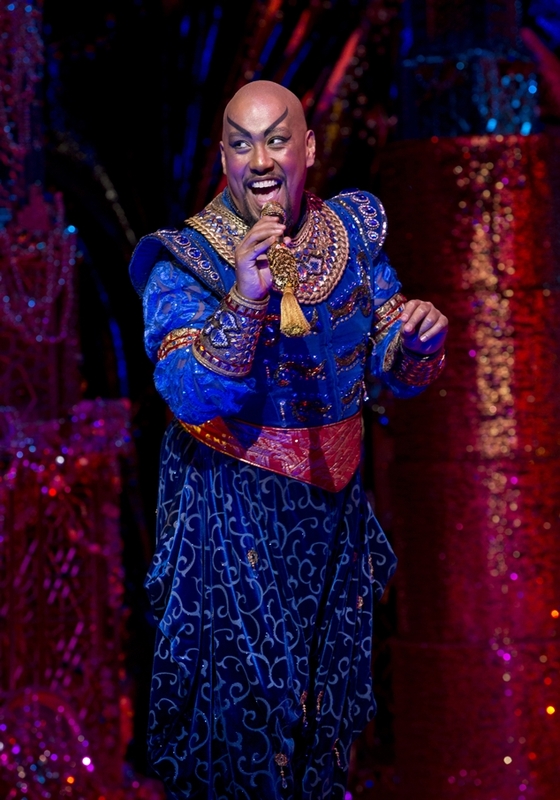 Playing the character as some twisted high-camp amalgam of Robin Williams and Tituss Burgess, Jacobs brings everything audiences loved about the on-screen Genie – and covers it in Swarovskis. Friend Like Me, Genie’s introduction to the other characters, is an absolute tour de force. Everything from Jacobs’ performance, to the sheer opulence of the set, to the myriad surprises lain throughout – the true magic had the audience scrambling to their feet with cheers and screams. Whether you can lip-sync along to the entirely of the 1992 film, or you’ve never even heard A Whole New World at a friend’s karaoke party – this musical is top-tier entertainment that absolutely everyone will enjoy.